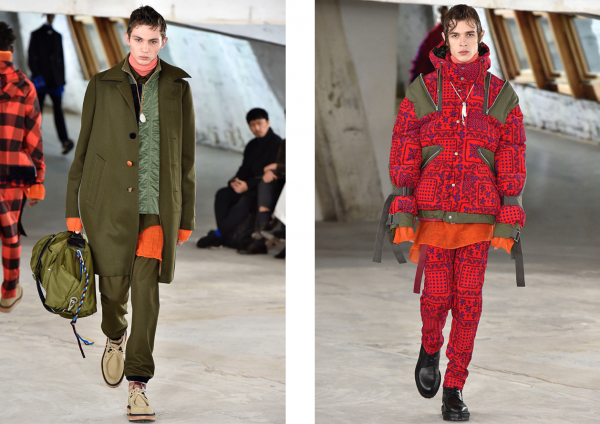 Chitose Abe knows how to seize the fashion moment. 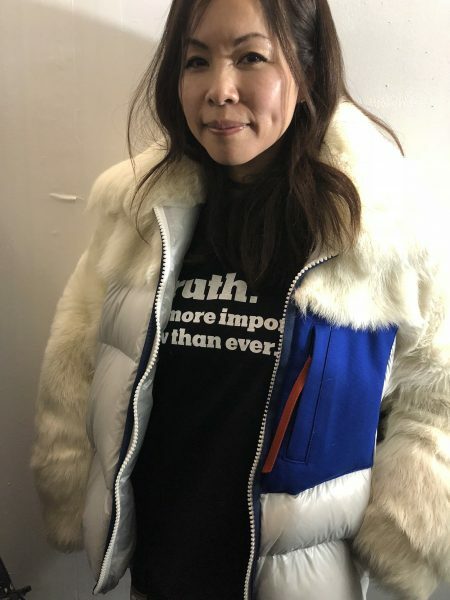 Message T-shirts and slogans are everywhere, her hybrid fashion of bomber jackets which morph into parkas is copied all over the world especially by the fast fashion monsters. But her joie de vivre and feeling for the Zeitgeist can not be copied. On a rainy Saturday morning in Paris, she created a sunny moment with her Hawaiian shirt inspired looks and army of fringe clad models, which created one thought amongst the audience: I want this. And desirability is at the core of fashion. Heavily fringing her fabrics and using her standard opposite attracts approach, she brought together Nordic knits with American military and Fair Isle fabrics with pinstripes. The approach was the same, haute hybrid but it looked fresh and the vivid colors made it desirable. 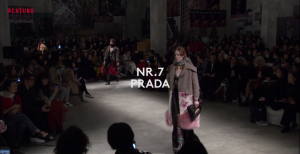 Many of the looks were wrapped cocoon style to properly dress these searchers of the truth. 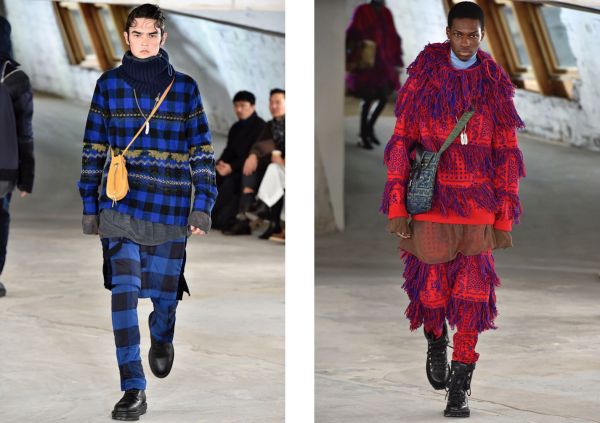 Sacai now does boots with Ugg and even if it was not an official collab, she owned the moment by printing the New York Times declaration: Truth, it’s more important than ever on her T-shirts and sweatshirts. Clearly signaling that her clothes are also statements and in tune with the times. Abe even wore a T-shirt herself backstage. By re-contextualing the Hawaii shirt and saying bye bye to her bandana prints, she came up with a new motif on corduroy and as embroidery on outerwear. As Japanese designers are always respectful to their inspiration, Abe made sure to quote Reyn Spooner, a pioneer in the making of the Hawaii shirt as her mood du jour. 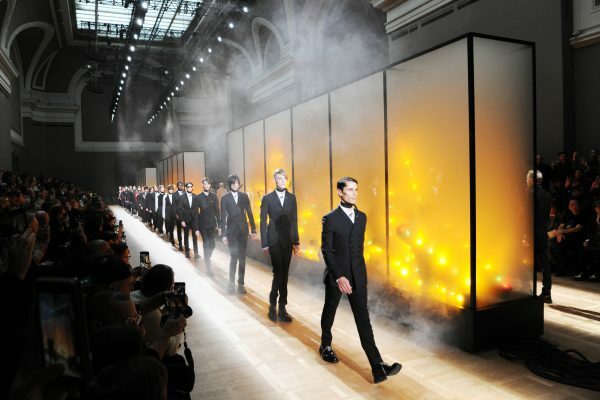 We have followed Kris Van Assche’s journey at Dior Homme from day one. In fact, this show marked his tenth anniversary at the house. 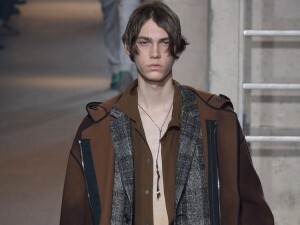 When he took over his first show with live violin players was a major show statement but the clothes were not stepping out of the Hedi Slimane shadow right away. In fact, the very emotional Van Assche was in tears backstage after the show because of all the pressure. Much has changed since then and this new collection, entitled Forever Young, was what we feel his best show so far at the house. 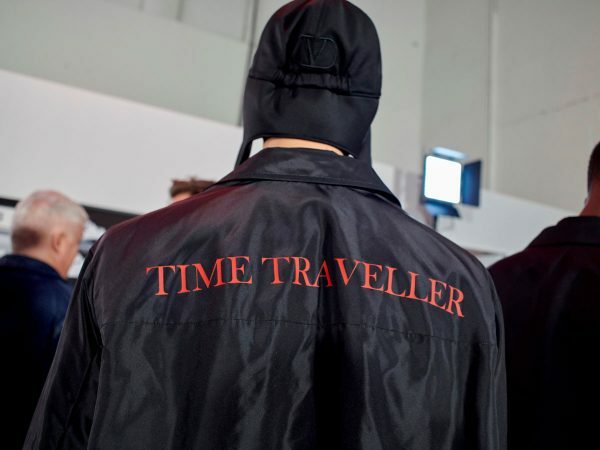 Bringing together old and young on the runway through his casting and his designs proved that he is the designer to look at for mixing street and tailoring culture with authority. The secret of this collection? The first five looks were entirely taken from the Christian Dior archives from the early 1950’s. And we are talking women’s looks. 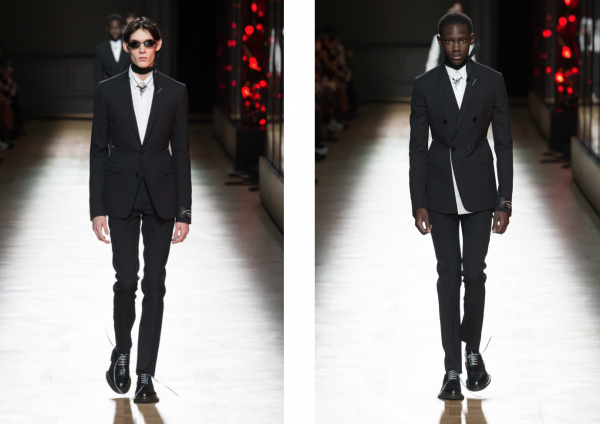 By making the round more square and compressing the silhouette, the master tailor Van Assche pulled off an impressive feat. In fact, the tailoring looked fresh and new and learning it’s from the archives makes it even more impressive. This is how Dior manifests its status as a fashion giant: Visiting the archives and pushing forward. Just look at the tight double-breasted jackets which all look like there were cut by lasers and not hands; you cannot make more body-hugging clothes. 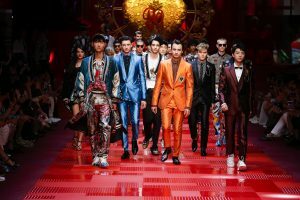 Using the Christian Dior studio address in a flaming print on the front and back of bombers coupled with slouchy and voluminous pants added an element of street couture to this show. 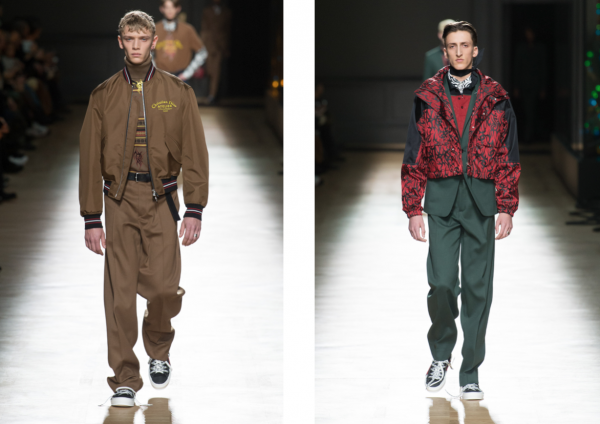 The casting: Opening the show was 90’s male super model Cameron and we also spotted Mark Vanderloo and our favorite Achtung Mode model Arnaud Lemaire in the line-up. We love Alphaville and so does Kris. He used the song Forever Young throughout in his show mix plus other cool samples from groups like Snap, which also hails from Germany. We have arrived in Paris from Milan. So stick with our coverage and see what we deem worthy. There is a lot out there. 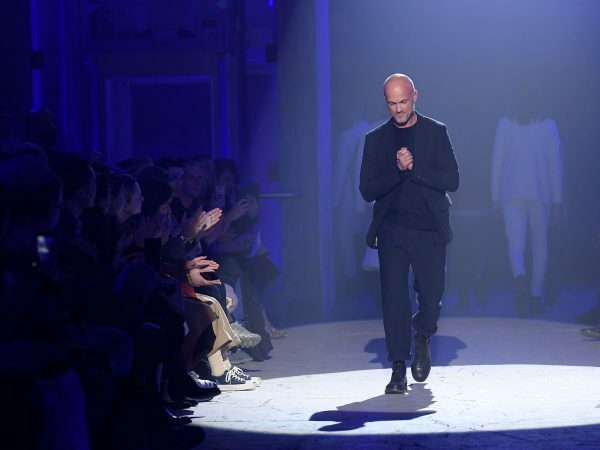 The season kicks off with a strong Pitti and the debut of Aldo Maria Camillo on the catwalk.